After making a muslin - fully lined and canvassed - by hand, and finding all sorts of things wrong with my original pattern, I adjusted the pattern and cut out my fabric. Here you can see the green/yellow linen I'm using. I've basted in the roll line and pocket lines (and then remembered I don't want a top/watch pocket on the right side) and basted in canvas for the pockets. The pocket pieces are below. This is going to take a while to finish, but I'm glad I made the muslin first - it taught me a lot. I'm not entirely sure how I'm going to do the notch collar. I made it in two pieces for the muslin, but I'd like to use just one for the final version, so I think I'm going to have to wait and add it in last when I can get an accurate measurement for the perfect size. 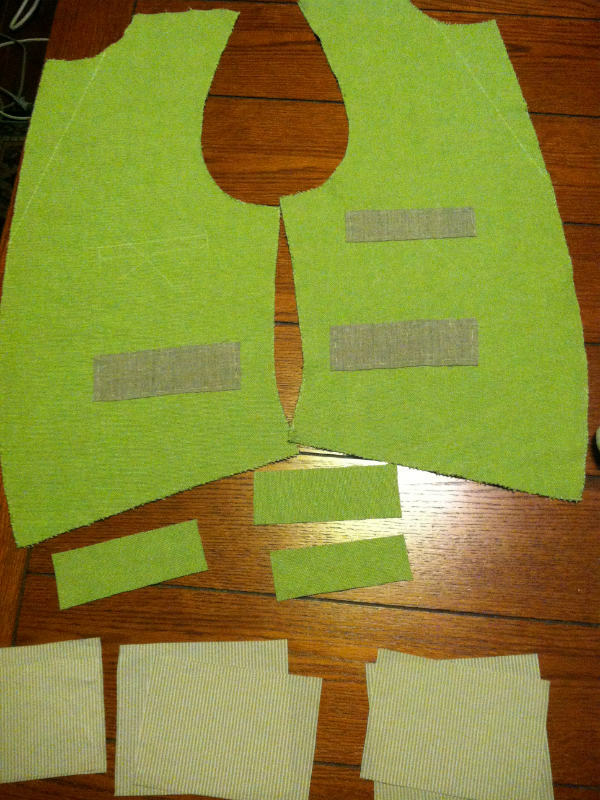 I'll pad stitch it, along with the lapels on the waistcoat.